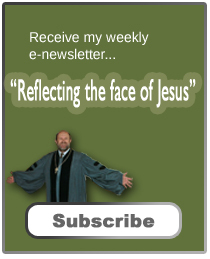 We’ve got a lot going on… A new elder ordained, quilts for valor, remembering saints, and communion. You’re probably thinking, “I hope he’s not too long this morning!” Well, you’re in luck! Instead of a full sermon, I’m giving you a homily. Homilies are by definition, shorter, more like a devotion and with less detail about the text. In a way, that’s sad because our topic today is something with which we all must deal. 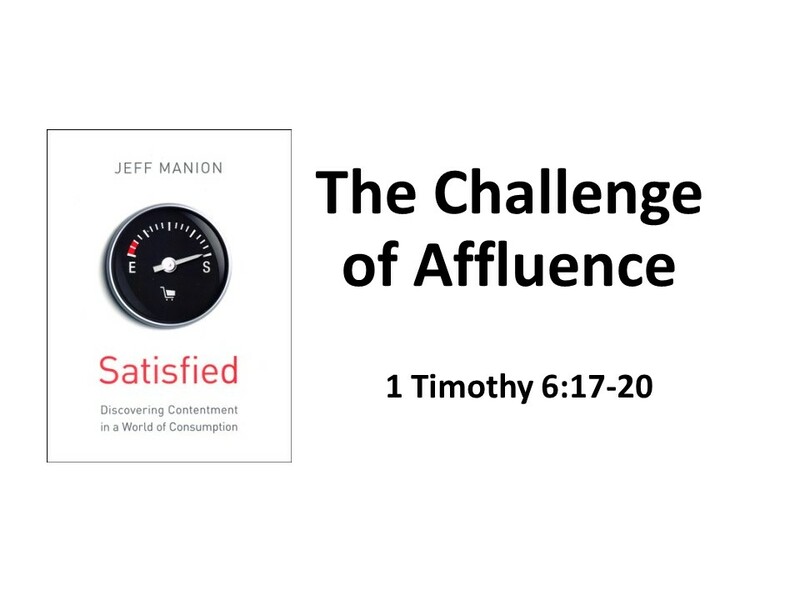 As I continue to work through the themes of Jeff Manion’s book, Satisfied: Discovering Contentment in a World Consumption, we are going to look at the Challenge of Affluence. It’s a topic our candidates for President could reflect on, as well as many others in our society. How do we enjoy and use what we have in a way that will bring God glory? Our text today is from the ending of the first letter to Timothy. Read 1 Timothy 6:17-20. What does our text say? Don’t be haughty. Here, we could use other synonyms such as prideful, conceited or arrogant. In other words, don’t be the type of person who, because of your riches, demand others look up to you. We should not flaunt what we have or use to benefit only ourselves. And we shouldn’t set our hopes in riches. We should place our trust in God who gives us everything for our enjoyment. Notice that Paul doesn’t tell Timothy that being rich is a bad thing. Instead, we are to see what we have as a blessing that comes from God. Too often, however, instead of seeing what we have as a blessing, we fall into a trap of thinking we’ve earned it, that the blessings rightfully belong to us, and that we have to guard and protect it. This letter is thought to have been written late in Paul’s ministry. Some scholars argue if Paul wrote it, or if one of Paul’s latter disciples wrote the letter and attached his teacher’s name to it. This doesn’t matter much for our understanding, except that we are given a glimpse into the early church society and learn that there were believers who were wealthy. By this point, the church no longer consisted of just poor fishermen and laborers and such. Paul also deals with those with affluence in his first letter to the Corinthians, where there were those who brought a feast to the fellowship and pigged-out while others went away hungry. So even in the early church, there were struggles between the haves and the have nots. Here, Paul challenges those with material wealth to keep their focus on God as the source of their blessings. They should be joyful, for they can enjoy these gifts, and in using and sharing the gifts they can become even more joyful. The other option is for those who are blessed to attempt to secure their wealth in a way that will only benefit themselves and their families. However, as Jesus reminds us, when we store up our treasures on earth, we have to deal with moths eating our fine clothing and draperies, rust consuming our cars and boats, and thieves stealing our jewelry and prize collections. Likewise, Paul reminds Timothy to teach those who are rich that through their sharing and giving, they will store up a good foundation for the future. Again, to go back to Jeff Manion’s book, “[W]e are to conduct our lives and manage our wealth in a way that moves us toward our Lord rather than pushing us away from him.” Or, as he asks somewhat sarcastically, “how [can I] fall deeper in love with God and not my deck furniture? Paul concludes this letter, reminding Timothy to guard what has been entrusted to him. Here, he’s not talking about riches or wealth that’s been entrusted to him, but about the gospel, God’s message. He must keep his eye on Jesus and avoid getting caught up in debates that take his eye off the mark. I think what Paul means here is that if we strive to twist Jesus’ teaching for our own benefit, we’re taking a great risk. Our only hope is found in God, not in our wealth or, as we see here, in our knowledge. Sometimes our knowledge misleads us. We are to trust in God as revealed in Jesus Christ, to enjoy all that he’s given us and to realize that all we have and all we are belong to God and are to be used for God’s glory. There was a father who took his son to McDonalds. The father was trying to be good and watch his weight, so he didn’t order himself any fries. But he got his boy a large fry, thinking he might slip one or two. As they sat down to eat, he took one of his boy’s fries and his son immediate slapped his hand. “These are mine, Dad, get your own.” This bothered the father. He worried why his son wasn’t grateful, for he was the one who had purchased the fries in the first place. “Maybe I should never buy him another French fry,” the father thought, but he loved the son and cherished times they were together, even those times at McDonalds. There would be more fries in the boy’s future. The father would just have to work on teaching him gratitude. God has given us great and good gifts. God delights when we enjoy them, provided that we understand from where those gives come and to whom they ultimately belong. “The earth is the Lord’s and all that’s in it,” the Psalmist proclaims. That includes our stuff. That includes us. It and we are all on loan from God. We need to live with a right attitude, one of generosity and gratitude, which will help us maintain a proper perspective as to the source of our blessings. Amen. Jeff Manion, Satisfied: Discovering Contentment in a World Consumption (Grand Rapids: Zondervan, 2013), 113.